Fresh corn, herb, and tomato relish is a mix that comes together naturally as the summer harvest peaks. When sweet corn kernels can be cut from the ears and popped in your mouth as a garden snack—well, that is the same time you are going to find meaty tomatoes ripe on the vine. For this recipe I picked two ears of sweet corn and red cherry tomatoes (Sweet 100s) from the garden (but plums like Roma and San Marzano or medium-sized tomatoes Early Girl or Stupice would do just fine–your fat beefsteaks might be a bit too juicy). To corn (this year I grew sugary Golden Bantam–a classic) and tomatoes you can add a bell pepper—red or green—cucumbers diced and to heat it up a chili—here I added a Serrano that was just ready. To this relish I added thyme, marjoram, and basil—growing right across the garden path from the tomatoes–but turmeric, ground cumin, and mustard seeds from the pantry would have worked equally well. If you don’t have one or more of these veggies growing in the garden, you will easily find them at the farm market (and, of course, out of season from your produce person). This recipe is for serving fresh—just let it sit a few hours or overnight in the frig. If you want to keep this relish for a month or almost two, put all of the ingredients in a thick-bottomed pot, bring to a boil, then reduce the heat to a simmer, cover and cook for 25 minutes. Then you can spoon this relish into clean jars and seal. Serve this relish with pork, on tacos or hot dogs, on sloppy burgers, or as a dip–or even as a side dish. It’s that good! If there’s left over juice use it as a marinade. So there you go! If you have a similar garden fresh relish—please let me know! 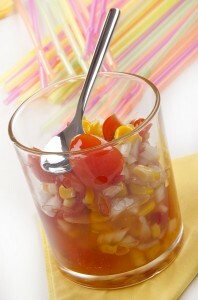 Place diced tomatoes and corn in a flat-bottomed dish. Combine remaining ingredients and pour over tomatoes and corn. Chill several hours, occasionally spooning dressing over tomatoes and corn.